(The first part of this article on Einstein and Baba appeared in our March, 2005 issue). In August 1989 Bhagavan invited our group of twenty one Americans for an interview. I resolved that, with His Grace, I would leave it knowing more about my connection to Einstein. During the interview Baba gave everyone private time, answered questions on all aspects of personal life, and blessed Marsha's and my entry into advanced studies in psychology. He materialized a diamond pendent for her, and a red, white and blue on gold pen¬dent for my daughter Nilima. I was sitting next to Baba in the same position as in 1978 and was filled to overflowing. "Einstein is a body. That body is dead. He was a very good man. Einstein was very patient. Peace, Peace, Peace. He was always thinking of Bhagavan." Swami: "What is a scientist! Science is the study of creation. Spiri¬tuality is studying the Creator." [Swami draws a circle with His finger on the wall:] "Man as scientist works from senses down. Man as Spirit works from senses up." [Points to top of circle] "See, science is only a ' C,' (tracing one half of a circle) but Spirit is full circle. It is the difference between this and that." Following are some of Albert Einstein's thoughts on what he considered to be most important in life: closeness to God and love of humanity. We can readily see how they correspond to the modes of consciousness, and attitudes of open heartedness, sadhana and service Swami strives to teach us. These thoughts of Einstein's and the exploration of the spiritual implications of his work to follow, illustrate how in some ways he can be seen as having helped usher in the Golden Age of Sai. I perhaps continuing to serve as an ongoing instrument in its fulfillment as well. "That deeply emotional conviction of the presence of a superior reasoning power, which is revealed in the incomprehensible universe, forms my idea of God." "The true value of a human being is determined by the measure and sense in which he has attained to liberation from the self." "A human being is a part of the whole, called by us the 'Universe', a part limited in time and space. He experiences himself, his thoughts and feel¬ings as something separated from the rest a kind of optical delusion of his consciousness. This delusion is a kind of prison for us, restricting us to our personal desires and to affection for a few persons nearest to us. Our task must be to free ourselves from this prison by widening our circle of compassion to embrace all living creatures and the whole of nature in its beauty... the striv¬ing for such an achievement is in itself a part of the liberation and a foundation for inner security." "I am happy because I want nothing from anyone. I do not care for money. I do not crave praise." "I want to know how God created this world. I am not interested in this or that phenomenon. I want to know His thoughts, the rest are details." "The principal art of the teacher is to awaken the joy in creation; and knowledge." "The ideals which have lighted me on my way and time after time given me new courage to face life cheerfully have been Truth, Goodness, and Beauty." "The most beautiful and profound emotion we can experience is the sensation of the mystical. It is the source of all true science." "The feeling from which true scientific research draws its spiritual sustenance"... "is a sort of intoxicating joy and amazement at the beauty and grandeur of this World... I maintain that cosmic religious feeling is the strongest and noblest incitement to scientific research." "Since, however, sense perception only gives information of this external world indirectly, we can only grasp the latter by speculative means." "I arrived at none of my major theories through rational thought." This last statement is so profound in its implications that it bears comment. It clearly points to the limitations of the Western worship of the logical, rational mind as the sine qua non of existence. It points up the fact that the greatest Western scientist in four hundred years, after reaching traditional science's outer limits could gain the insight he craved only by transcending the mode of thinking that brought him to those limits. Only then, through the faculty of "nonrational Intuition or openness” could he accurately perceive some of the underlying reality of the universe. To Einstein's sadness, a major response to his discoveries about relativity has been fear about the future of the planet itself. I am not a physicist or mathematician; but I offer several thoughts about this question. I believe that not only can the example of Einstein's life stand as a blessing to humankind, but that one of the most profound expressions of his work can serve as well: the formula E = mc² (energy equals mass times the velocity of light squared). We are accustomed to think of this formula in primarily negative terms the unleashing of the atom's destructive potential. Paradoxically, I feel that it embodies something of a most heartening spiritual nature as well. E = mc² mathematically expresses the unity to which Swamiji frequently refers, through its having scientifically established that matter and energy—the tangible and the invisible—are wholly equivalent and interchangeable i e., that mass is simply concentrated energy; and that energy is mass minus form. Bhagavan Baba places great emphasis on teaching us that the whole of existence, matter, energy and spirit, is One, stemming from the Supreme, Indivisible, Absolute. He asserts that what we dualistically think of as 'Matter versus Spirit' are in reality "two sides of the same coin", inseparable from their source in Divine Consciousness. 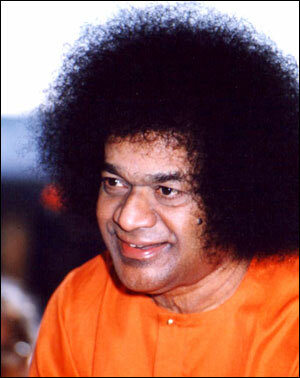 In all of His communications Swami invites us to reduce our fascination for the world of matter and to get rid of the illusion that only what can be perceived by the senses is real and valuable. He asks us to develop awareness of, and reliance upon, the Atma our invisible, Indwelling Divinity. Baba's teachings help us realize the truth that matter, much less the energy from which it is derived, could not have been originally created from matter: that matter being congealed energy, is "nothing but gravitationally trapped light" and itself derived from conscious¬ness. This Consciousness is Spirit—Divine Thought—which is quite invisible in and of itself, but is in fact the bed¬rock of existence and the source from which the Mayic illusion of duality springs. If we consider Spirit to be the highest manifestation of energy, I think Einstein's formula can stand as a source of confirmation of the reality of Spirit to a pre¬dominantly materialistic world which doubts the existence of a Loving Intelligence. At a subtler level, the human mind is a form of energy whose work manifests in both positive and negative ways. Negatively, it is well established that the mind can contribute to such mental and psychosomatic illnesses as depression, or high blood pressure and ulcers. Benign influence is apparent in the mind's healing response to such non-materialistic interventions as therapeutic conversation, or the presence of compassion or love. How much more so the profound, demonstrable effects of cosmic or spiritual energy upon matter, (from invisible to "visible”) in terms of the transformation of human thinking and functioning? Though one cannot generally see spiritual energy (in the form of God's intentionality or Grace) many of us have seen and benefited from its effects in our own lives and those of countless others through the boundless Grace of our beloved Sai. To expand: Starting with denser forms of energy, we might consider Einstein's discovery E = mc² as a metaphorical “two sided coin", with one side dark, the other light. On the "dark" side, it seems that by tracing matter, visible and tangible, to its most extreme potentiality, we ob¬serve that it transmutes into energy, having a destructive effect upon other matter (nuclear fission). If we do the reverse, and trace energy, diffuse and invisible, back through its various forms; from radiation, combustion, electricity, and human thought, we come to its ultimate state, Divine Thought, which we know can exert a most constructive influence upon matter. Einstein's formula accomplishes two things: It teaches the fundamental truth that "All" is in fact "One", and that the various forms of this One can be used either for our annihilation or for our highest good, depending on the consciousness with which it is used. Paradoxically, E = mc² provides both the means to destroy the world, and scientific validation of a liberating truth that everything is interconnected and stems from one source. (The threat of the former perhaps also motivating us to seek the latter). That Source, Reality which Einstein laboured to discover, has come among us in the form of Bhagavan Baba. 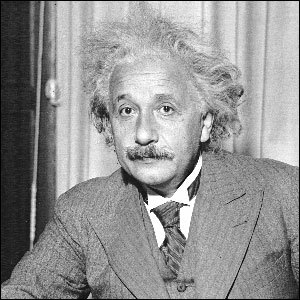 While the Lord, in His infinite wisdom, granted Albert Einstein rare insight into some of the workings of His creation, and though Einstein revolutionized science and our perception of reality, like any of us, he was not fully able to grasp all aspects of his favourite subject of study. Like Spinoza, Einstein asserted his belief in an impersonal God saying, "I can't believe in a God who gets involved in the affairs of men." Ironically, though he helped in preparing us for the Presence by demonstrating the essential unity of all creation, like Moses, Albert Einstein glimpsed but did not enter the Promised Land: he died never knowing that the Eternal Principle he sought had actually come among us. Baba's Presence here among us, perhaps the greatest expression of Hi love, and far transcending our limits knowledge, represents the perfect synthesis of energy and matter, time and space. To gaze upon Him is in fact to see energy and matter combined in their most mysterious and perfect form. When we consider the fact the Baba has given us His personal assurance that the world will not end in nuclear annihilation, we can know that we are beyond the shadow of the fearful implications of E = mc² and in the light of His Divine Presence, which beckon us to realize that energy, as Light, Love—God—is our only Reality. Firmly rooted in this truth, we can confidently proceed with our individual roles in Swami's transformation of the present era into a Golden Age of Divine Consciousness, utterly permeated by His Love. May Sai bless us with the faith and skill to traverse this world, always remembering who He declares we are: A true synthesis of matter and Diving Energy.